Malta Maritime Directory :: Euromed Malta Championship 2014 - A Possible Record Entry Again! Comment about: Euromed Malta Championship 2014 - A Possible Record Entry Again! Euromed Malta Championship 2014 - A Possible Record Entry Again! Romanian sailor Ebru Bolat, overall Optimist European Girl Champion 2014, looks forward for success in her third Euromed participation. Written by Wilfred Sultana. The Optimist Sailing Dinghy is acknowledged as a one design single handed sailing craft where only sailors under the age of 16 years are eligible to contest in this class racing. This is the largest junior class in the World and a recognised ISAF International Class. Since the year 2000 the Malta Young Sailors Club has made it an annual December appointment to host the Optimists Class EUROMED Malta Championship which from a modest start fourteen years ago has become a prime international sailing attraction with last year's edition attracting 138 sailors from 8 countries. This 4-day event, which is contested by both male and female young sailors, is organised with the cooperation of the Kunsill Malti għall-iSport and the Mellieħa Local Council and is held under the patronage of the Malta Sailing Federation. This year the 15th Edition of the Optimists Class EUROMED Malta Championship will be held between the 19th and the 22nd December with Melieha Bay once again being the racing arena. The Malta Championship is also an attraction to Laser dinghy sailors where participation is not constrained by an age limit. The participants will be split up into five categories namely the Optimist Cadet Class, the Optimist Open Class, the Optimist Novice Class and two Laser Dinghy Classes - Laser Radial Class and Laser 4.7 Class. With less than two weeks to go for the event the number of participants stand at 120 sailors from 9 countries - Cyprus, Ireland, Russia, Spain, Italy, United Kingdom, Greece, Romania and Malta. Ireland, Spain and Greece are newcomers to the Malta event. Undoubtedly this is an excellent turnout which can increase over the last few days prior to the start even surpassing last year's record entry. The biggest three foreign contingents hail from Sicily with 29 sailors, Ireland with 16 sailors, and Russia with 14 sailors. 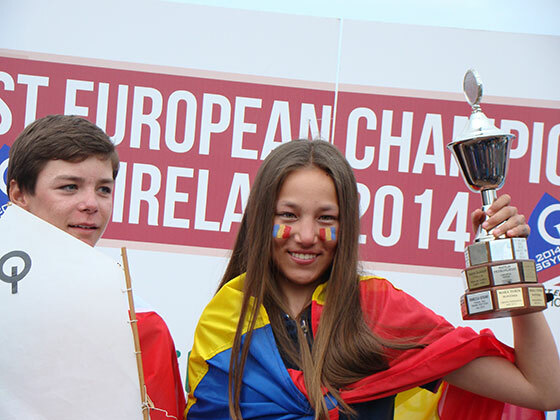 A distinguished participant this year will be Ebru Bolat from Romania who last July in Dublin was declared the overall Optimist European Girl Champion 2014. Bolat will be on her third Euromed participation which she is yet to win. Fourteen editions which find Maltese sailors leading with 5 victories, the Russians have three victories and the Swedish are with two wins. Great Britain, Ireland, Italy and Turkey are all represented with one victory each. Malta's Thomas Zammit Tabona is the only winner who has won the Euromed on two occasions - 2006 and 2007 - while Russian Nikita Ushkov in 2009 at the age of 11 became the youngest ever winner of the Championship. The Euromed is not only a big challenge to Maltese young sailors but a great opportunity to participate in an international event against other foreign sailors on home waters thus without the need to travel overseas. For the foreign sailors, who are normally accompanied by other members of their family, the Malta Championship is an occasion to enjoy a competitive event in milder weather conditions from those prevailing in their countries. Furthermore the foreign groups always go on excursions to Malta's places of historical and cultural interest. Certainly, Euromed is an established winter event and a typical local attraction under the sport tourism spectrum. As usual the Malta Euromed Championship will be held under the jurisdiction of a panel of International Jury Members. Luigi Bertini of the Federazione Italiana Vela will be Jury Chairman who will be assisted by Henry Sleutel (Netherlands), Bojan Gale (Slovenia), Carol Heines (Great Britain), Jovin Rausi and Godwin Zammit (Malta). Peter Dimech is the Championship's Principle Race Officer. The official hotel of Euromed 2014 is the Seabank Resort+Spa in Mellieha while Maxima Lido on the sandy beach of Mellieha Bay will house the race office and the launching area of the Championship.